Experience the iconic race, from a new point of view. 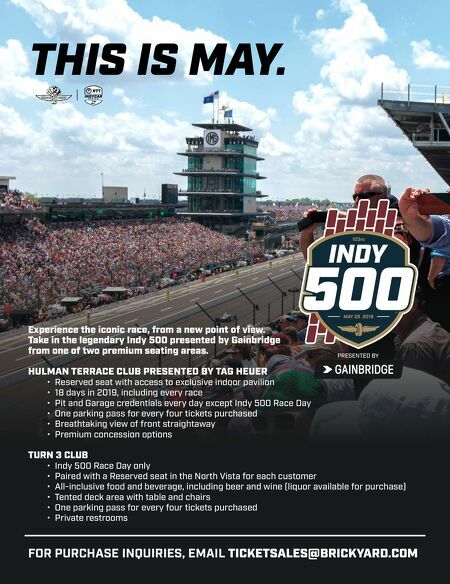 Take in the legendary Indy 500 presented by Gainbridge from one of two premium seating areas. HULMAN TERRACE CLUB PRESENTED BY TAG HEUER • Reserved seat with access to exclusive indoor pavilion • 18 days in 2019, including every race • Pit and Garage credentials every day except Indy 500 Race Day • One parking pass for every four tickets purchased • Breathtaking view of front straightaway • Premium concession options TURN 3 CLUB • Indy 500 Race Day only • Paired with a Reserved seat in the North Vista for each customer • All-inclusive food and beverage, including beer and wine (liquor available for purchase) • Tented deck area with table and chairs • One parking pass for every four tickets purchased • Private restrooms FOR PURCHASE INQUIRIES, EMAIL TICKETSALES@BRICKYARD.COM THIS IS MAY.